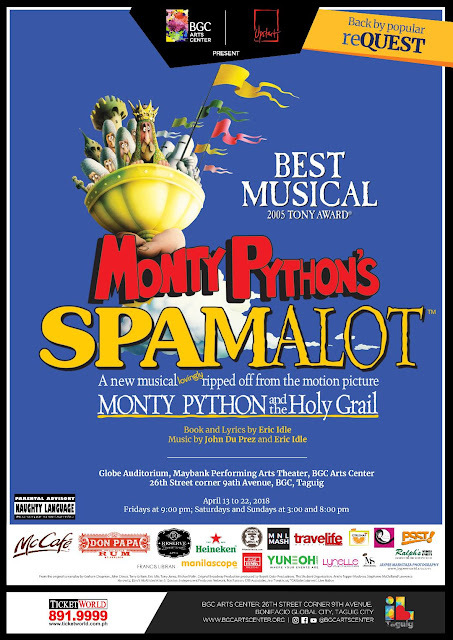 Monty Phyton's SPAMALOT is back by popular reQUEST! - Triple Joys!!! Monty Phyton's SPAMALOT is back by popular reQUEST! The best-reviewed musical comedy of 2017 is back! MONTY PHYTON'S SPAMALOT at the Globe Auditorium, Maybank Performing Arts Theater, BGC Arts Center!Catch the limited run of this "hilarious" (ABS-CBN Lifestyle) Tony Award Winner from April 13 -22, 2018 . Text 0917-8116156 or e-mail upstarttickets@gmail.com for ticket information.